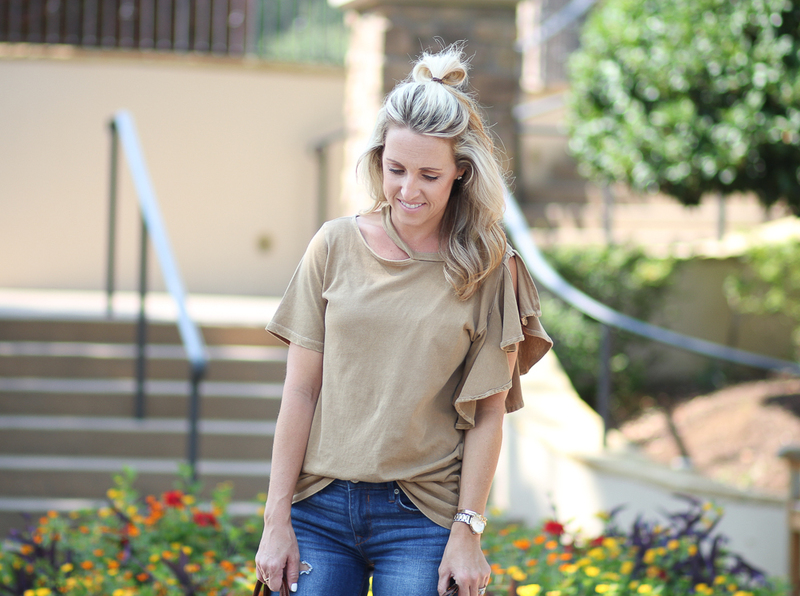 The simplest, and probably most popular combo, is jeans and a tee! So basic but it doesn't have to be boring. There are so many fun tees right!! There's nothing new about pairing your favorite jeans with a tee for a quick and basic look. Heck, it's my go-to over the weekend or when I'm running late. But that basic look doesn't have to be boring! I love wearing tees that have something special, like cut outs, ruffles or peplum. It makes for an updated look. The added details help the outfit be anything but boring. I saw this tee online and loved how unique it was. One shoulder is ruffles and the other has a cut out along the neckline! It also comes in a light grey, but I love this color for Fall. I've rounded up some other favorites below. The velvet tee is amazing and will look great on it's own or layered under a cardi. I've already ordered it ivory! !